Many a time tennis players and chair umpires have had run-ins, resulting in no-handshakes. It was a different case on Wednesday though at the end of the first round match between Jelena Ostapenko and Kristie Ahn at the Claro Open in Bogota. 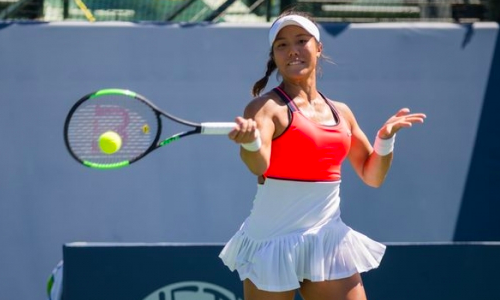 Ahn, a little-known American, pulled off an upset win over top-seeded Ostapenko, a former world No. 5 and French Open champion, winning 2-6 7-6 7-5 in two hours and 31 minutes. Following the contest, the duo exchanged customary handshakes at the net before Ostapenko went up first to greet the umpire. Then came Ahn, who stuck her hand out, only for the umpire to not notice it. Subsequently, Ahn called out the umpire more than once before he finally realized his mistake, and shook hands with her. Her campaign came to an end after she went down 4-6 7-6 3-6 to Maria Camila Osorio Serrani in the second round on Wednesday.